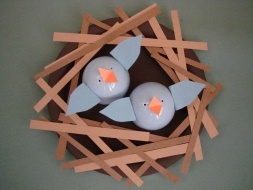 We made Baby Blue Birds, but you can make your baby birds any color you'd like. This is a cute and fun spring time craft for preschoolers on up! 1. Paint your paper plate brown. If your plate has a waxy finish on it you may need to put on 2 coats of paint. 2. Now you will make your baby birds. Fold a small piece of orange construction paper, cut out a triangle on the fold, this will make the bird's beak. 3. From construction paper cut out two wings for each of your birds. Make a small fold at the bottom of each wing, this will give your a place to put the glue. 4. Glue your beak and wings onto your birds. Most plastic eggs have air holes on them, which will look great as your bird's eyes. If your eggs don't have air hole, you can draw some on with a permanent marker. 5. Put some glue on the bottom of your eggs and glue your birds into their nest. 6. Cut some brown strips of paper. 7. Glue the brown strips around the lip of the paper plate.